Kat and Karl : this is all you get! here is donald the deer. we will be eating him all winter long. come over for some - our freezer is FULL. um....lunch is over. i don't want to WORK today!!! Does everyone feel like that some days?!?!? nice label. my labels alphebetize themselves, i must fix that. ps way to go karl for murdering donald. way to GO. your middle paragraph confused me. happy early b-day matt p.
i can't wait for thanksgiving. i have the menu planned in my head already. 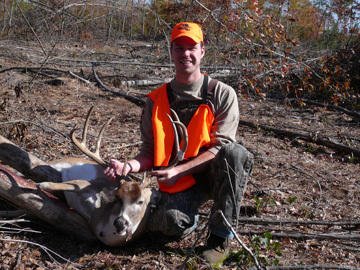 I grew up looking at dead deers in real life (my Dad and his brothers are big on the hunting), but I've never understood why in the photos they have to hold up the dead head. It must be a guy thing. P.S. A get together over t-giving sounds fantastic. Mucho looking forward to it! HURRY UP AND GET HERE!!! LOL Yes that would have been me and that stuff is still on there..you should have waved I bet I would have recognized you!! Good job Karl-if this was the old days you could keep your family well fed! Where was the buck killed? is that bambi's dad? i'm gonna go cry now.